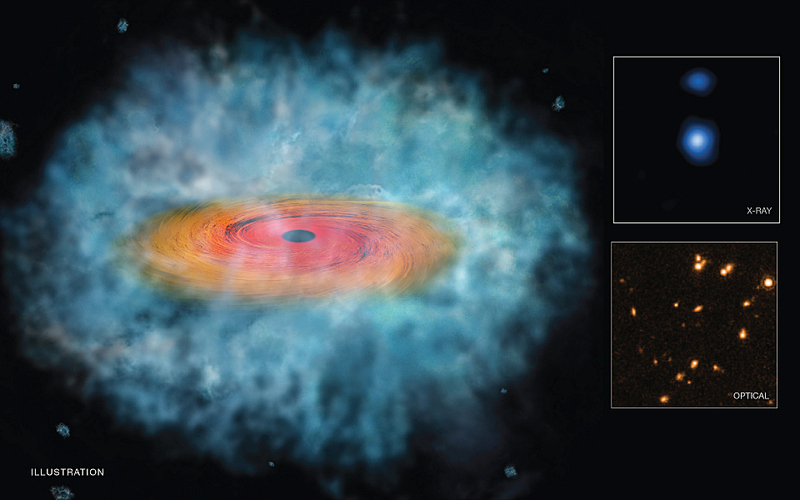 This illustration represents the best evidence to date that the direct collapse of a gas cloud produced supermassive black holes in the early universe. Researchers combined data from NASA’s Chandra, Hubble, and Spitzer telescopes to make this discovery. Illustration credits: NASA/CXC/STScI. For years astronomers have debated how the earliest generation of supermassive black holes formed very quickly, relatively speaking, after the Big Bang. Now, an Italian team has identified two objects in the early universe that seem to be the origin of these early supermassive black holes. 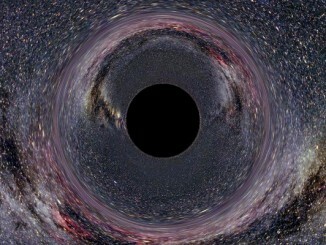 The two objects represent the most promising black hole seed candidates found so far. 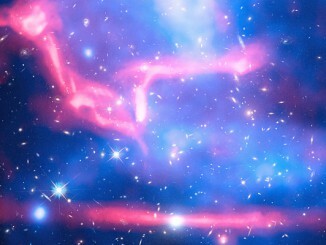 The group used computer models and applied a new analysis method to data from the NASA Chandra X-ray Observatory, the NASA/ESA Hubble Space Telescope, and the NASA Spitzer Space Telescope to find and identify the two objects. Both of these newly discovered black hole seed candidates are seen less than a billion years after the Big Bang and have an initial mass of about 100,000 times the Sun. “Our discovery, if confirmed, would explain how these monster black holes were born,” said Fabio Pacucci, lead author of the study, of Scuola Normale Superiore in Pisa, Italy. This new result helps to explain why we see supermassive black holes less than one billion years after the Big Bang. There are two main theories to explain the formation of supermassive black holes in the early universe. One assumes that the seeds grow out of black holes with a mass about ten to a hundred times greater than our Sun, as expected for the collapse of a massive star. The black hole seeds then grew through mergers with other small black holes and by pulling in gas from their surroundings. However, they would have to grow at an unusually high rate to reach the mass of supermassive black holes already discovered in the billion years young universe. The new findings support another scenario where at least some very massive black hole seeds with 100,000 times the mass of the Sun formed directly when a massive cloud of gas collapses. In this case the growth of the black holes would be jump started, and would proceed more quickly. Even though both black hole seed candidates match the theoretical predictions, further observations are needed to confirm their true nature. To fully distinguish between the two formation theories, it will also be necessary to find more candidates. The team plans to conduct follow-up observations in X-rays and in the infrared range to check whether the two objects have more of the properties expected for black hole seeds. Upcoming observatories, like the NASA/ESA/CSA James Webb Space Telescope and the European Extremely Large Telescope will certainly mark a breakthrough in this field, by detecting even smaller and more distant black holes. When a star collapses forming a black hole, a space-time singularity is created wherein the laws of physics no longer work. In 1965, Sir Roger Penrose presented a theorem where he associated that singularity with so-called ”trapped surfaces” that shrink over time. That hypothesis — one of the results of the general theory of relativity — is now celebrating its 50th anniversary. 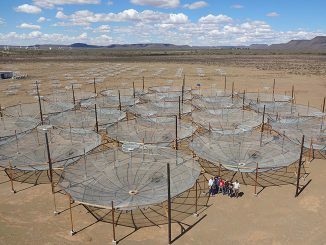 The National Science Foundation has approved funding to expand the Hydrogen Epoch of Reionisation Array (HERA) in South Africa. Upgrading the number of antennas from 19 to 240 by the year 2018 will enable HERA to study more clearly the impact of cosmic dawn, the moment a few hundred million years after the Big Bang when the first stars and galaxies blazed awake. MACS J0717, some 5.4 billion light-years away from Earth in the constellation of Auriga (The Charioteer), is the result of four galaxy clusters colliding. This image is a combination of observations in visible light, X-rays and radio waves from the NASA/ESA Hubble Space Telescope, NASA’s Chandra X-ray Observatory, and the NRAO Jansky Very Large Array.